I love having themes because they help me pull things together quickly. It's become especially helpful in the past few years, since I've become a one woman children's department! Novem-Bear has always been one of my favorite themes and I blogged about it last year. But just because it's the same theme doesn't mean it's the same materials. I do have favorites, but I'd go out of my tree (well more so than usual)if I did the same things year after year. And there is so much bear stuff! Goldilocks. Teddy bear stories. "Jesse Bear" and "Jamberry" and more! 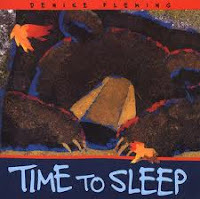 In Denise Fleming's Time To Sleep all the animals are getting ready to hibernate. I knew that bears hibernate, but I didn't know that snails did! Or ladybugs. I really need to look it up--good thing I've got all those books in the non-fiction! 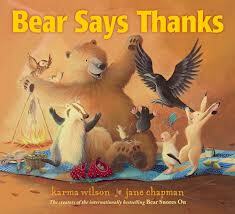 I love "Bear Snores On" best of the Karma Wilson series, but this one is great for the fall and Thanksgiving. Bear's friends all come to share foods with him and Bear gets sad because his cupboard is "bare". But his friends tell him that's okay, because he has something else to share: stories! We talked briefly at the 2 & up programs about "bear" vs. "bare", but when I had preschool classes I emphasized it a bit more. I don't tend to do too much with the "literacy messages" because my goal is to get parents to read and share books with their kids, but once in a while when it's relevant, I like to comment without driving the message home with a sledgehammer! 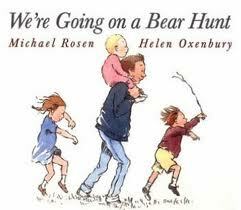 I was doing the "Bear Hunt" game long before Michael Rosen's book, so I just suggest the book as a follow up to the game we play! I love adding bits to this game--this year after we swam a river we all made a "fire" (I lit the match, of course!) and toasted marshmallows. And when we went through a swamp and I complained about the mosquitoes, one of the kids immediately said "I have bug spray!" That's why these games never get boring--they're never the same twice! The Wiggles LOVE kids--3 of the 4 originals were all training to be preschool teachers and it showed in the way they performed. I went to see them live in concert with my girls when they were little and we all had a blast--you could tell how much the Wiggles loved what they do, just as I do. This clip of them singing "Rock A Bye Your Bear" will show you what I mean-- even the kids who don't know the Wiggles love this song. And last, but not least, I love "The Bear Went Over the Mountain". 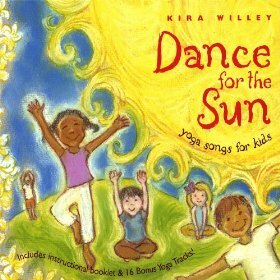 It's a great song to use as a game with the little ones, marching your hand/bear up and down their arms, and bigger kids can just sing it: Oh, the bear went over the mountain, the bear went over the mountain, the bear went over the mountain, to see what he could see! And what do you think he saw? What do you think he saw? The other side of the mountain, the other side of the mountain, the other side of the mountain, was all that he could see! So the bear went over the mountain, the bear went over the mountain, the bear went over the mountain, so very happily! But he's not happy, because now he's far away from home! So repeat both verses so he can see his home and get back to his house "so ve-ry hap-pi-ly!" And now for a two week break to clean up my storeroom and office, celebrate Thanksgiving with my family and get ready for December, which brings "The Nutcracker!"